'MILLION DOLLAR VIEWS' IN COLORADO! We are a PREMIUM Resort with all amenities. Directly across from Mesa Verde National Park. Perfect base for all attractions in the Four Corners area. Activities for all the family. Shady cedar trees throughout. Visit soon! Our site did not have any shade, but bathrooms were clean. The showers are directly overhead, which meant you could not avoid wetting your hair. The internet was horrible. First time we stayed here. This place is walking distance to the Mesa Verde National Park entrance. The staff were super friendly and accommodating. The restrooms are spotless as is the laundry room and showers. There's a nice pool and mini golf area. Next door is horseback riding. Check out time is 11am. When we couldn't get the Mesa Verde national park cliff dwelling tour in the morning, the staff here worked with us to allow a very late check out so we could go on the only tour left for the day (note to self: make tour reservations as early as possible). We will definitely be back here. Can't say enough good things about this place. This is the worst RV Park we have ever stayed at in our thousands of miles traveled. We travel in a 2016 Allegro 37’ and were given a “big rig” site. What a joke, as the site was not even large enough for our RV and car to park. The bath room for the “big rig” sites was no more than an outhouse with a flush toilet. No A/C in a 4 x 4 shed in 95 degree heat. I though I was going to pass out while using. The sites are cramped with no space between units. The owners were the rudest people I have ever encountered. They claimed our dogs barked all night long yet we never left the unit the day of arrival and our dogs did not make a sound. They asked us to leave the next day and refused to give a refund. My guess is they wanted us out so they could book a longer stay. Do not waste your money on this park. The absolute BEST RV Park! Quaint, quiet and literally right across the highway from Mesa Verde... And the view in each direction is spectacular. You are within driving distance of more National Parks, Monuments and scenic drives. We had a spacious, shaded pull thru spot. The park is well maintained, pet friendly, and all the hosts friendly and helpful. Felt like I was a welcome friend instead of a customer. They worked magic to help us extend our stay...on Memorial Day weekend!! Fabulous people, fabulous park. This is a first class facility. It is quiet at nite. The spots are roomy. The park is spotless. The owners have done a ?????? great job making for a good experience at Ancient Cedars! We didn't use the restroom or laundry facilities, but are sure they are on par with the rest of the park. We will be sure to stay at the park again. They are just outside the gate to Mesa Verde N.P. What a great combination! Sites are too narrow! Sites were designed for small travel trailers. Sites are not level. Was not impressed with the management. Made me checkout on time even though I had a flat tire on my tow dolly. Couldn't even let me park off to the side until I could get help. There was a large dog area for exercising the dogs off-leash and a nice store. Showers are limited to 5 minutes or you will be scolded and told to get out. Signs are posted in the bathroom and shower area clearly saying 5 minute showers. We did not know this before checking in or we would have picked a different park. We need 10 to 15 minutes to shower adequately. Most sites have no to little shade even with a premium site. Space between sites is the with of a picnicking table. Although some sites do have grass between them not all do. Internet although available is poor at the sites and we used our own jet pack wile in the park. You can use your computer at the main building and get internet there. The pool area was clean and adiquate. They have a family hot tub and a adults only hot tub. They have a game room with a large tv and microwave. Sites do not have fire rings but they are available for rent on a daily basis. They have a well stocked freezer of Ice cream and steaks and a nice camp store. Biggest appeal is the national park is across the street. Would not stay again, we will drive for the cost of staying here and the lack of shower access. Spent a month in this heaven. Looking out kitchen window at the Sleeping Ute is amazing. I chose this campground after one conversation with the owner. I have not been disappointed. Owners are on site working on grounds every day. Clean, and family friendly. Great little store and the laundry is sparkling. Nicely located between Mancos and Cortez and Durango is a short ride also. We ( my wife and I ) are new to RVing and thoroughly enjoyed or recent stay. Could not ask for better accommodations including a spacious dog run. Location to The cliff dwellings was WALKING DISTANCE! Overall the place is good. Roomy sites. However don't plan on using the showers if you have hair longer than you chin! My daughters who BOTH HAVE LONG HAIR were SCOLDED for taking a longer than 5 minute shower! I'm sorry but if you have long hair there is no way in hell it's gonna take 5 minutes to take ur shower! I have pixie cut hair and it took me just shy of 15 minutes to shower and that's not shaving or brushing my teethbin the shower either. Stumbled across this excellent RV park on a recommendation from Mesa Verde National Park, (Arawak?) concessioners who informed me that their campground was not open but this one was right across the highway from the Park was and is very nice and quite convenient. We liked it so much we stayed 3 nights. Off season so very quite and beautiful views! 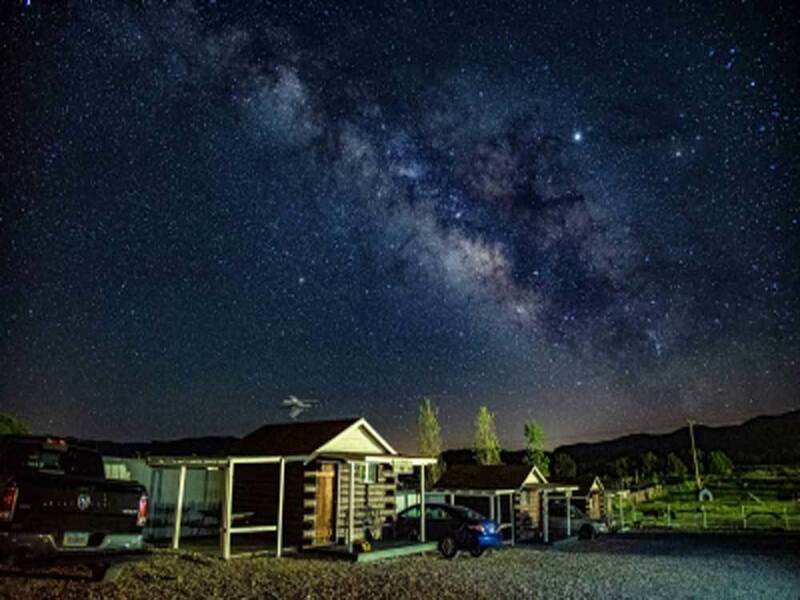 We would highly reommend this RV park foe anyone who wants to spend time in the Cortez, Mesa Verde Park, Durango area. Some great indian ruins in that area over 1000 years old! Very friendly staff. Great location very close to the entrance of Mesa Verde National Park. Large playground and nice spacing between the sites. Small campground, but nice spaces - mostly shaded. The view of Mesa Verde is beautiful. The staff was very friendly. We had a propane tank issue and they were very helpful. The kids enjoyed the pool and mini golf. We stayed over Labor Day Weekend. The town considered this time frame to be off season, but the owners made us feel welcome. The owners suggested place to eat and things to do that were still open for the season. The facilities were nice with a homey woodsy feel. Nice folks ,aim to please, they just purchased it recently and had done many upgrades. We used a water/elec only pull through site at a reasonable cost .Very close to Mesa Verde, actually a better campground than in the park, we checked it out later on our trip. Would have stayed longer but had to move on.